Last week, my mom and I took the kids on an evening walk at the park near our house. It’s down a steep hill and typically Dennis and I take turns pushing the stroller, in order to make it back up the hill. This was the first time I was going to attempt to push it the whole way. I took several short breaks and realized that it was actually easier for me to run short bursts and then stop to catch my breath, rather that walking and pushing the whole way. The kids got into it. Teo and Sienna started giving me encouragement, “You can do it Mom! Just a little farther. Make it past that blue car!” Then they starting making up an elaborate race scenario where I was competing against the parked cars along the street. I was concentrating on the pain of my exertion, but their story made me giggle and I did feel the spark of their enthusiasm. Once we made it to the top, my mom and the kids kept up with the encouragement and praise with “Hip hip hooray” for mom. It was silly but I did feel accomplished. Today, I took Teo with me to Miramar Lake for a run. He wanted to ride in the stroller, but Sienna wanted to stay home to play; I figured this boded well for my ability to push the stroller. As we headed out for the 5 mile loop around the lake, Teo started in on the race scenario again. “Beat those people Mom, you can do it!” There were a lot of walkers, runners, cyclists, and in-line skaters on a Saturday morning at 10:00 a.m., so there were many opportunities for us to pass people. “Good job, Mom! You can beat those people too. Make it all the way to the finish line!” Teo kept rooting me on. Enjoying my son’s company and sweet perspective that Mom could do anything, brought a smile to my face. We counted down the miles via the mile markers along the path. I genuinely felt that the run was easier with my little coach encouraging me. At one point a cyclist passed us and Teo said, “Beat the bike, Mom!” I had to explain that bikes were faster than runners. “Why?” he predictably asked. Around the halfway mark, my coach fell silent. Sure enough, he had fallen asleep. 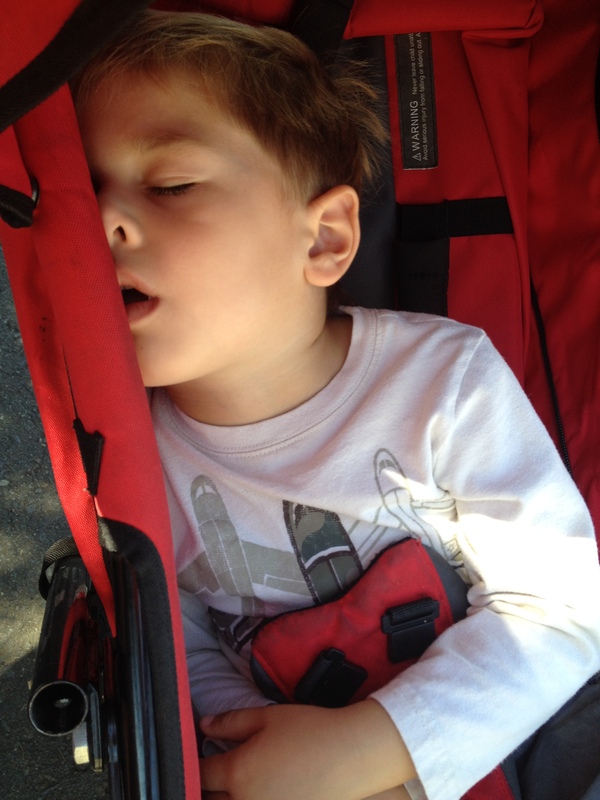 Then, a mile or so later, he perked up and said, “Make it all the way to the finish line, Mom!” and fell back asleep. He must have sensed I needed a little encouragement. During today’s run, I reflected on how different my attitude toward exercise is now. Before my awakening, I spent a lot of time and energy planning my exercise. I wanted my workouts to be productive and felt “in control” when I fit in a certain number of runs or swims each week. Now, I’ve let go of that need to plan my exercise. I stay active with walking, running, and swimming fairly regularly because I love it. Life is busy and ultimately my priority is being with my kids. When I can spend time with my family and break a sweat at the same time, that’s a win/win.